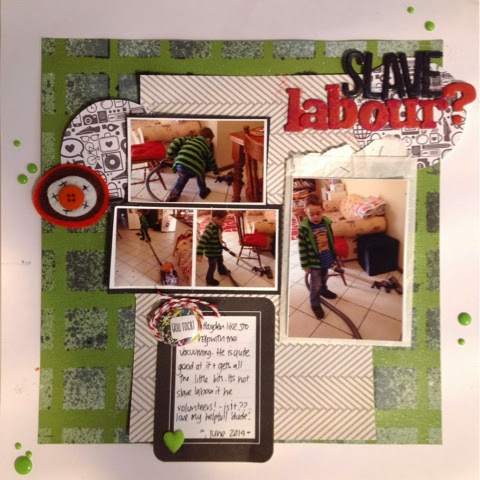 scrappinwithjanet.. : Scrap The Boys September Challenge .. Domesticity!. Scrap The Boys September Challenge .. Domesticity!. The moment I saw the challenge for September I KNEW what I was doing. My 'lil guy commonly known as Hurricane likes to hinder help when I'm doing the vacuuming so this was all about him. Slave Labour? Never - his future partner will thank you one day! Thanks for playing along with STB. Love the colour palette, it works beautifully with the photos. Thanks for sharing it with us at Scrap the Boys.